As we begin a new year, it’s always fun to look back on all the great things that happened in the last year. The needs of our clients have always led the evolution of the NetGalley service, and I’m proud that our conversations with various types of publishers continue to drive our development. Through these conversations, it has become apparent that publishers of all sizes are relying on data to assess how their strategies are working, and if they’re reaching their goals for engagement. More and more of you are employing data scientists, or are analyzing data yourself. Numbers from all across the industry come together to reveal the story about a book’s success. You’re tracking and analyzing results that range from engagement with your social media platforms and click-throughs for your digital advertising, to sales numbers and rankings. One of the purposes of NetGalley has always been to give you more insight into the success of your pre-publications efforts. Many reports in NetGalley (including Feedback, Opinions, Snapshot, and Detailed Activity) already offer a deep dive into the specific activity your titles are seeing on the site. During the Firebrand Community Conference this year our CEO and Chief Igniter, Fran Toolan, mentioned the DIKW hierarchy–a model that emphasizes the relationships between data, information, knowledge, and wisdom. The idea is that each level of the pyramid is reached through analysis that adds context to the level below. So data will lead to information, which will lead to knowledge, which will lead to wisdom. Once you reach wisdom, all of that learned experience can guide your actions. In 2019 we’re excited to bring you even more tools to drive targeted activity on NetGalley, and to display valuable data and information to help you reach those levels of wisdom that can inform your strategies. When you analyze the activity happening in your NetGalley account, it can help you identify early trends so you can anticipate them as your books go on sale, or give you evidence that support a change in strategy. We are committed to continuing to build tools that will reduce manual effort and time for your staff, and give you more space to gain knowledge about your strategies and the activity they’re generating. It’s our New Year’s Resolution to continue to help you attain wisdom about your strategies, and strive for it ourselves, too. To learn more, join our webinar on Wednesday, Jan. 30 all about NetGalley Advanced–our new, premier level of service. Social Sharing on NetGalley is Buzzing! Word-of-mouth is one of the most effective ways to increase book sales. Whether this chatter happens face-to-face with friends, or digitally through online reviews or social media shares, the earlier audiences are talking about your book, the better! In order to facilitate this digital word-of-mouth, NetGalley introduced simplified social sharing in November 2017, to allow NetGalley members to connect their NetGalley profile with their Twitter, Facebook, Goodreads, and LinkedIn accounts to share their reviews with just one click. Incorporate hashtags: Publishers can add a custom hashtag for any title on NetGalley. This helps to focus the buzz around a title, and can make members feel like they are joining a rich conversation online. Ask members to share their reviews on social media with the hashtags when you follow-up with them, and then use those hashtags to identify your most vocal pre-publication advocates. Retweet them, favorite them, and consider auto-approving those members in NetGalley! For more information about including hashtags in your NetGalley marketing plan, check out this 2-minute video. Share the shares: If NetGalley members are sharing reviews on Facebook, Twitter, and elsewhere, consider using those reviews in your own social strategy. Retweet or re-post the reviews you see, and be sure to thank the member. Everyone loves a shoutout! Use screenshots or quotes of these shared reviews to demonstrat e the word-of-mouth energy behind your titles and include them in sales presentations. They are visible proof of early consumer interest. 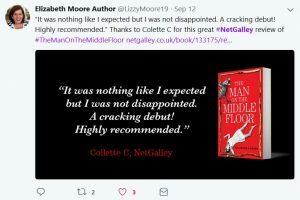 Learn more about your audience: In addition to watching your hashtags, you can use your NetGalley Feedback Report to see who has shared their reviews online. Digging into your data, including the social media presence of members who are talking about your book online, can give you some powerful demographic information about your audience. Are they mostly millennials who post on Instagram? Are they primarily baby boomers who use Facebook to stay in touch with their friends and family? Use this insight to guide your marketing messages and to determine which platforms are worth your investment of time or advertising dollars. How have you successfully leveraged social media sharing in your marketing campaigns? We love to feature case studies from our community of publishers and authors.